We unearth some new features in Glu's hack-and-slash adventure. This week, dungeon crawling fans can get their collective fix with Eternity Warriors 2, Glu Mobile's newest monster-bashing adventure. We posted the first gameplay trailer and screens yesterday. Now, it's time for some new details on this promising and positively brutal iOS and Android game. -Each level has dozens of common and rare weapons and armor loot drops. Weapons and skills can be upgraded to include new attributes and provide overall stronger performance. -There are four unique environments: two towers and two dungeons. Each has its own unique demon types and bosses. Towers focus on exploration and dungeons feature classic wave-based onslaughts that provided great co-op sessions. -There are quests to complete as you level up and unlock new environments. -Eternity Warriors 2 features iCloud saving for iOS devices. 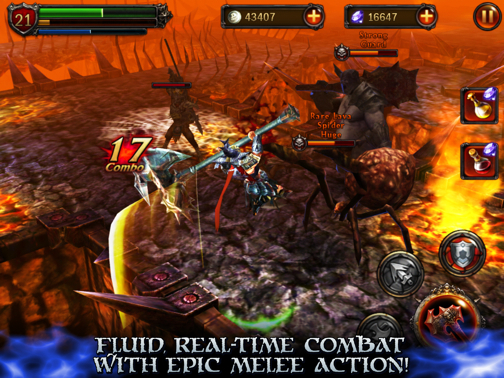 Look for Eternity Warriors 2 on the App Store and Google Play this week.